Join us in welcoming GennaRose Nethercott, winner of the 2017 National Poetry Series Competition, as she debuts her boldly original and visceral collection, The Lumberjack's Dove. The Lumberjack's Dove brings to bear an enchanting fabulist sensibility in her haunting story of a woodsman who cuts his hand off with an axe--only to watch it shapeshift into a dove. Nethercott's striking inciting image gives way to what Pulitzer Prize-winner and former Poet Laureate Louise Glück calls "a meditation on attachment, on loss, on transformation." Far from representing just an event of pain and loss in the body, this incident spirals outward to explore countless facets of being human, prompting profound reflections on sacrifice and longing, time and memory, and--finally--consider the act of storytelling itself. The lumberjack, his hand, and the axe that separated the two all become participants in the story, with unique perspectives to share and lessons to impart. "I taught your fathers how to love," Axe says to the acorns and leaves around her. "I mean to be felled, sliced to lumber, & reassembled into a new body." Inflected with the uncanny allure of modern folklore and animated by the sly shifting of points-of-view, The Lumberjack's Dove is "a book of unexpected lightness and buoyancy," Glück says. Expect to be charmed by the revelatory, richly textured poetry from a boundlessly creative new voice. 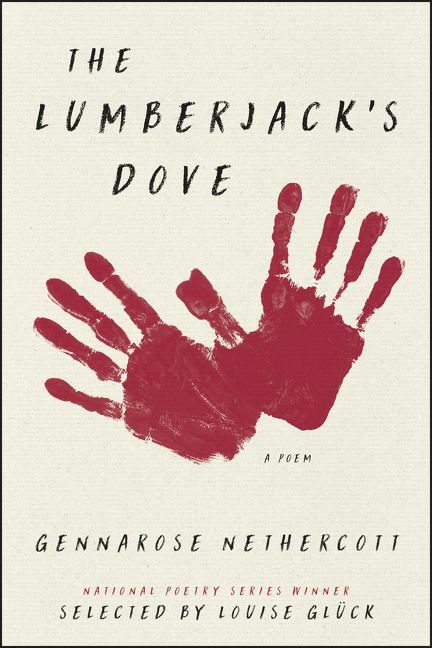 GennaRose Nethercott's book The Lumberjack's Dove was selected by Louise Glück as a winner of the National Poetry Series for 2017. She is also the lyricist behind the narrative song collection Modern Ballads, and is a Mass Cultural Council Artist Fellow. Her work has appeared widely in journals and anthologies including BOMB, The Massachusetts Review, The Offing, and PANK, and she has been a writer-in-residence at the Shakespeare & Company bookstore, Art Farm Nebraska, and The Vermont Studio Center, among others. A born Vermonter, she tours nationally and internationally composing poems-to-order for strangers on a 1952 Hermes Rocket Typewriter. This event is free and open to the public. Most of our events are held upstairs, but we do not have an elevator. To join the signing line and have books signed by the author at this event, please consider purchasing your copy of The Lumberjack's Dove from Country Bookshelf, either in-store, over the phone, or online (scroll down). By purchasing your book from Country Bookshelf, you are not only supporting a locally owned, independent business, but you are also showing publishers that they should continue sending authors to Country Bookshelf. The author's previous titles will be available for purchase at the event as supplies last.